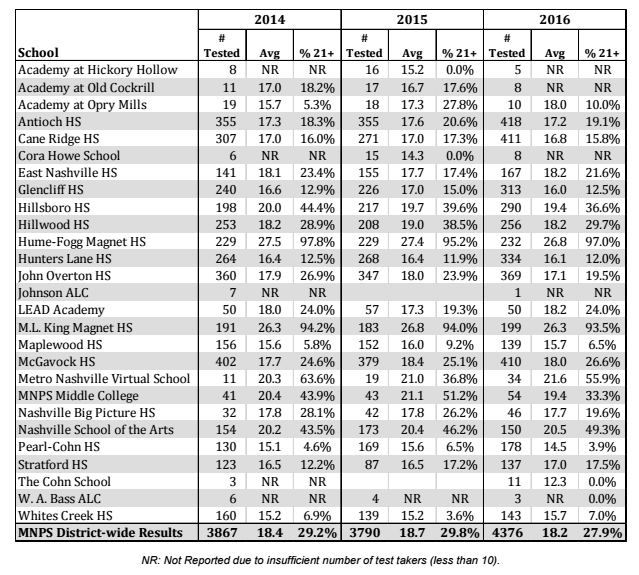 Tennessee Education Report | How Did MNPS High Schools And Subgroups Do On The ACT? This entry was posted in School Improvement, Testing and tagged ACT, ACT prep, ACT Preparation, Alignment Nashville, Hillsboro, Hume-Fogg, Hunters Lane, Maplewood, Metro Nashville Public Schools, MNPS, Overton, Tennessee Education Report, TNEdReport, Zack Barnes. Bookmark the permalink. Pingback: Tennessee Education Report | TNReady Assessment Data for MNPS Are In! How Did They Do?